Welcome back to school after a cold Easter holiday! This term we have the SATS and so we will do some revision to ensure we are ready for the tests. This is a great opportunity to revisit areas of maths and literacy to make sure confidence levels are high and we will have a chance to see some of the types of questions we are likely to encounter. We will be investigating the Tudors in our topic work, and looking particularly at Tudor exploration. We will create hyperlinked documents in ICT and will be editing movies later in the term. In science we will finish our study of how we see things and move on to electrical circuits and micro-organisms. Creating puppet theatres in design technology is a super activity as we act out our puppet shows to reception. Towards the end of the term, we have an exciting interactive theme based on Formula 1 racing. Now, is there anything else? Ah yes - the Year 5 & 6 end of year performance. Watch this space! 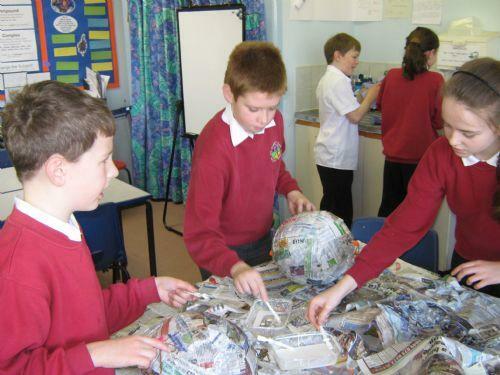 Last week we departed from our normal timetable for a few days, and focused on art and crafts. In year 6 we decided on a North American theme. 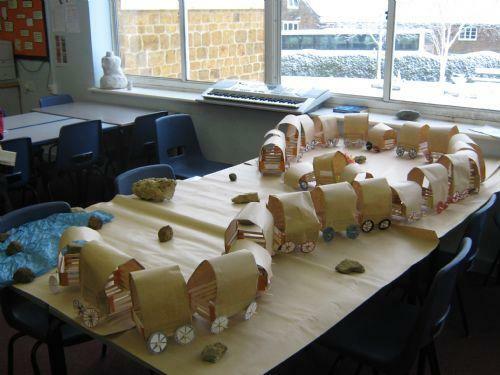 We made covered ''Pioneer' wagons, globes and native indian hats. 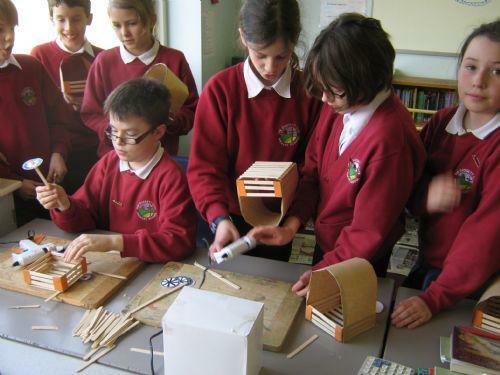 We worked with a wide variety of skillsand techniques, and I was very impressed by how hard the children worked, and the quality of what they created. We have also had a big push on writing this half term. The children have been developing their knowledge of sentence types in literacy, and putting this knowledge into practice in different writing tasks. The class has taken to this with great enthusiasm; they clearly enjoy their writing! Welcome back all, and a very Happy New Year! Year six have already got under way with our new literacy unit, which looks at biography and autobiography. For this we will be learning about Anne Frank - her story and her diaries. We are also doing plenty of work on grammar including sentence construction and word functions. In science we are investigating changes, both reversible (such as separating the parts of a solution of salt water) and irreversible (such as concrete setting). Our topic work will involve investigating the local area, including mapping, looking for evidence of land use and change and a field study. 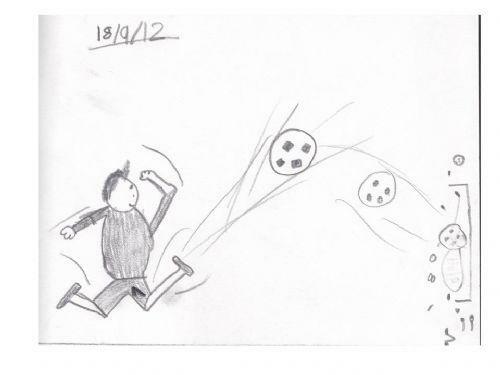 On the subject of fields, if it does stop raining for long enough we might actually get a game of touch rugby on grass. Here's hoping! Keep up the hard work Year 6! Time really is flying! Since half term, we have started our new ICT topic, and are exploring a language, called Scratch, for writing our own (simple) computer programs. Scratch was developed by MIT to help young children understand the basics of programming. It is very colourful, and interactive and it is possible to make things happen very quickly and easily. It is already popular, with some children already using it at home. To download, go to scratch.mit.edu. We have started building a classroom creature in DT! If only the field would dry out, we could get on it and play tag rugby, but we are leaning how to throw and catch (and intercept) rugby balls in anticipation. We have had some great discussions about wind farms in literacy, where we are learning how to write for and against a controversial issue. Finally, we are planning our class assembly, which is on Friday 23rd November. We are well under way with our new Literacy topic: Short stories with flashbacks. In music we are singing the blues, and the class will have an opportunity to compose their own blues lyrics and music later this week! Planning for an experiment to find out the force required to stretch an elastic band is now complete, and we are ready to use our forcemeters in anger. For computing we are using Excel formulas to calculate numbers automatically, and will use this as the basis for creating our own simulations based on impacts on the environment. And... we have managed to get outside every week so far this term, so our cricket fielding and batting skills continue to improve. We are coming to the end of our literacy work on news reports, and have planned and started to write a radio news report, based on the experiences of a babysitter and a baby with superpowers! Also this week, in science, some excellent writing about what gravity is and what it might be like on the moon. All the work is on display in the main corridor, near the front door. Come and have a look! 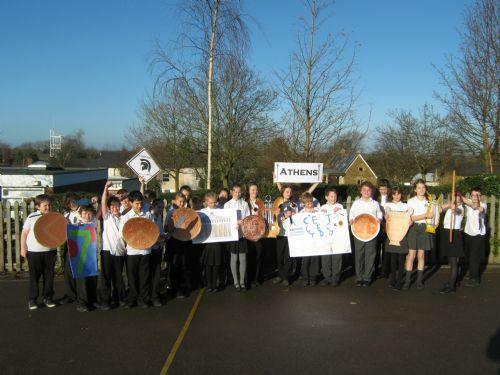 We have started looking at Greece and it is clear we have a well-travelled class: several children have been to Greece and some could name the Acropolis. A great start! We are about to write our first news report in literacy, and we have been doing a little Kung-fu to help us remember punctuation rules. The children have taken to their new responsibilities well, and have been brilliant in helping the new Reception class settle in. Year 6, the Teachers as they see themselves and as the children see them! Caricatures drawn by the winners of a class competition.